EarthRights International (ERI) filed an action in federal court today on behalf of a protestor paralyzed by police violence at the site of Newmont Mining’s Conga mine project in Peru. ERI is seeking documents and information from Newmont to assist in pending legal proceedings in Peru related to the police repression of protestors against the Conga project. 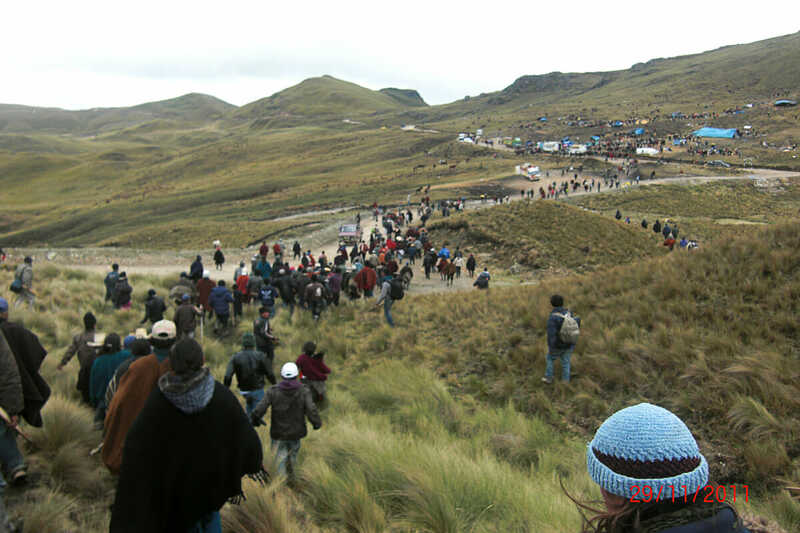 The Yanacocha mining company – a Newmont subsidiary – contracted with the Peruvian National Police for the provision of security services at the planned mine site, and the police officers involved in the repression of November 29, 2011 have told local prosecutors that they were providing security to the company. The proposed Conga mine has generated strong community opposition; the project would mean the destruction of lakes held sacred by local people, who depend on the lakes as a major source of water. Mr. Campos is seeking information held by Newmont – including photographic and video evidence, reports of Yanacocha security or employees, records of communications with the police, and internal company communications – that shed light on the events of that day. If provided, the requested information will assist Peruvian legal authorities currently investigating the incident in both a pending criminal investigation against the two commanding police officers and a civil lawsuit brought by Mr. Campos against the police and other government actors. “We hope the action in the United States supports the legal efforts underway in Peru to seek justice, accountability and greater protection for human rights, and helps to end a culture of impunity for police repression of legitimate protest activity,” said Mar Pérez of the National Human Rights Coordinator, which is representing Mr. Campos as an aggrieved party in the criminal investigation. The federal court motion was filed under the Foreign Legal Assistance (FLA) Statute (28 U.S.C. § 1782), a law which allows parties to foreign legal proceedings to obtain documents and information from individuals or companies in the United States in service of foreign proceedings. In addition to EarthRights International, Mr. Campos is represented in the federal court action by Gail Johnson of Johnson, Brenner & Klein, PLLC, based in Boulder, Colorado.